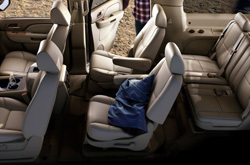 Does the Tahoe have what you want out of a vehicle? Scroll past the video to find out! Our Chevrolet reviews are compiled by veteran automotive writers - it's just another resource we provide as a well-known Chevrolet dealer in Springfield. As you read this article, you'll see that it is loaded with practical material on all of the things you're looking for in the new Tahoe. Watch the video below or skip it to get the Tahoe review. 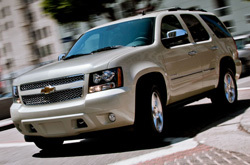 When comparing the 2013 Chevrolet Tahoe head-to-head with the 2013 Jeep Grand Cherokee, Dodge Durango, GMC Yukon, Ford Flex, Buick Enclave and the Toyota Sequoia, and you'll realize that the Tahoe out does those autos in loads aspects. Scan just a few of the reasons below. Don't go to a megacorp auto repair center in Springfield, MO when Reliable Chevrolet's exceptional repair techs are just a short trek away; plus you'll get a long-term warranty on every job and access to bona fide OEM products. Your Chevrolet will stay in muscular shape with work from the competent auto repair authorities at Reliable Chevrolet's service center. We will deal with a task as effortless as an oil change, or complete involved auto repairs and service like timing belt replacements, strut and shock repairs and Chevrolet transmission rebuilds. It's unquestionable - to get thrifty prices and aces Chevrolet repairs, Reliable Chevrolet should be your main choice when electing a Springfield auto center. Check out our service specials by clicking on the link below.